The rightest Hindu leader Bal Thackeray is on life support, and reports that the 86 yr old politician is near death brought Mumbai to a virtual standstill on Thursday as businesses closed and residents cleared the streets. Mr. Thackeray, the supreme leader of Shiv Sena, the extremist Hindu organization has been suffering from breathing problems. Backers of Shiv Sena have staged riots and protests in the past and have shut down the city on several occasions. 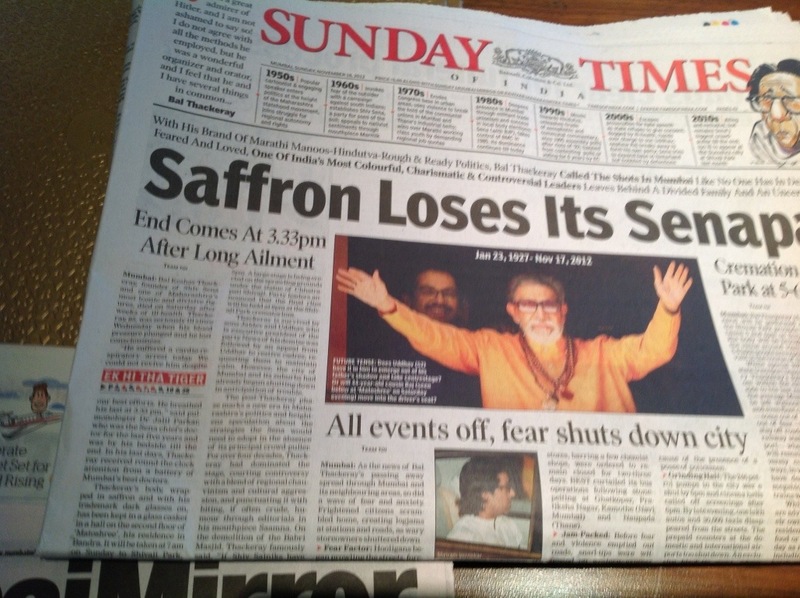 Epilogue…..Thackeray has passed. City of Mumbai a virtual ghost townas fears of riots keep people and shopowners at home. This entry was posted in Uncategorized and tagged Going to Goa Blog, mumbai. Bookmark the permalink.